At the Law Office of Nathan Cobb LLC, we are fully committed to helping you secure maximum compensation for injuries and losses that you or a loved one sustained as the result of someone else's negligence or wrongdoing. Serving clients throughout New Mexico, Nathan Cobb has more than a decade of legal experience and a vast network of resources to build the strongest case on your behalf. When you or a loved one is dealing with a tragic injury or loss, the last thing you need is a law firm from a billboard trying to move you in and out as quickly as possible just so they can collect their fee. As a lifelong New Mexican, Nathan genuinely cares about helping those in need in our community, and he will work tirelessly to ensure that those injured or wronged at the hands of another receive the compensation they deserve. Nathan has handled hundreds of cases for New Mexicans, including wrongful death and catastrophic injuries claims related to car, truck and motorcycle accidents, slip-and-fall accidents, and many other preventable tragedies. Nathan has tried cases to judges and juries all over the state, and he knows what it takes to fight and win a lawsuit in New Mexico. When you are involved in a tragedy, it's important that you have an expert on your side to assist and guide you through the process. Nathan established our law firm in order to provide this type of expertise to New Mexicans, and their families, who have suffered through a serious or deadly accident and the injuries that result. Don't be fooled by the commercials and slogans promising you aggressive representation only to be stuck with unreturned phone calls and pressure to take whatever offer comes in the door first. Nathan makes it a point to meet and talk with you throughout the process, to learn about you and your situation, and to provide the personalized advice and legal counsel necessary to aggressively and effectively represent you. At the Law Office of Nathan Cobb LLC, we will not only protect your legal rights, but we will also ensure that you receive the personal care and attention that you deserve throughout the process. This includes making sure that you or your loved ones are able to obtain the medical treatment and other help necessary to get you back on your feet after a tragedy. It is this high level of commitment to our clients that has earned our law firm's reputation as one of the top in the area for those dealing with personal injury and wrongful death claims. If you suffered a serious injury or lost a loved one due to an accident that was not your fault, you have rights. 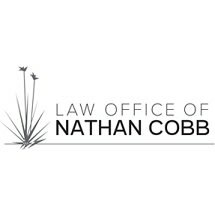 By contacting the Law Office of Nathan Cobb LLC and taking advantage of our firm's free initial consultation as soon as possible, you can begin the process of securing a brighter future for yourself, your family and those you care about while holding the parties responsible for your suffering accountable for their actions.